Get there before 10:30 PM! Be over 18 years old! 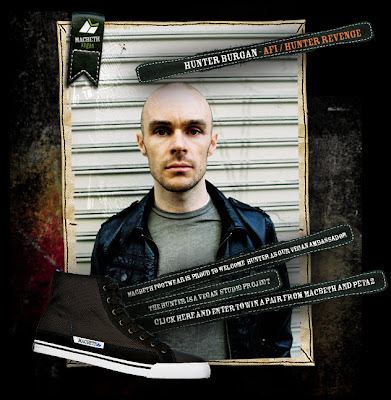 See Hunter Revenge play like never before in 2009!!!! *Will not actually be there. As many of you know, I am a fan of horses. While they are not my favorite animal (that title remains with the mammoth), horses are still unarguably great. So I thought, why not put them up up against something else unarguably great...like Fugazi. So, for the first Tranquil Mammoth Challenge of 2009, I've pitted beast against band. Let's see who comes out on top. Date of Origin Horses were probably first domesticated between 4,500 and 2,500 BC. Fugazi's lineup solidified in late 1987. Evolution DNA evidence shows modern horses are descended from not one but several wild populations. After Minor Threat broke up, Ian MacKaye played in several groups before starting a new band with Colin Sears and Joe Lally. Sears was soon replaced by Brendan Canty. Guy Picciotto, who had been in Rites of Spring with Canty, joined as a second vocalist after his band, Happy Go Licky broke up. Picciotto began playing second guitar before their first album, Repeater was recorded in 1989. Propensity for violence Stallions will often challenge and fight other stallions, often if a mare is present. Fugazi discourages violence and violent dancing at their shows. Quantity Experts estimate that there are more than 75,000,000 horses in existence. There is only one Fugazi. Strength Horses are very strong. I personally estimate their strength to be roughly 1 hp (horsepower) or 33,000 ft·lbf/min. Trouser Press describes Fugazi as "a knuckle sandwich made with nine-grain bread, building strong minds and bodies with rattling guitar power." Height Measured in hands: This horse is 15 hands high! Measured in inches: This Fugazi record is a 12"! Live Performance Horses star in horse racing, dressage, eventing, show jumping, and rodeo as well as films and tv shows. Their performances range from utilitarian to beautifully graceful to exhilarating. Fugazi concerts are exciting, engaging and memorable. than to have us sucking in his store"
Speed The average horse gallop is 25 to 30 miles (40 to 48 km) per hour. 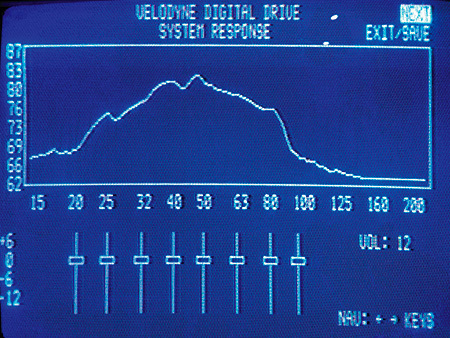 Some Fugazi songs exceed 200 beats per minute, although their average song tempo is much slower. Food Horses are herbivores. Fugazi's members are all reportedly vegan/vegetarian. Water You can theoretically lead a horse to water, but you can't make it drink. "One drink of water and I'm drowning"
Meaning of Name I'm pretty sure it stands for 'Hold On, Ride Solid, Equus', although I may have just made this up. From Mark Baker's Nam, a compilation of stories of Vietnam War veterans, where it used as a backronym for 'Fucked Up, Got Ambushed, Zipped In'. Current Status Horses are currently everywhere, eating. Fugazi is currently on an indefinite hiatus. It looks like the first Tranquil Mammoth Challenge of 2009 has resulted in a tie, and I'm not surprised. Both Horses and Fugazi have proven themselves to be truly great. Send me some suggestions for the next Tranquil Mammoth Challenge of 2009. Win with Macbeth, Peta2, and Tranquil Mammoth! Do you want to win a pair of my new Macbeth shoes ("The Hunter") and an iPod Nano loaded with a bunch of music that I have personally selected? I sure would like to win that stuff! Unfortunately for me, I'm not allowed to enter, but you probably are! Click on the picture above to visit the Peta2 site and enter. This ends February 2, 2009, so get going! Waste no time! 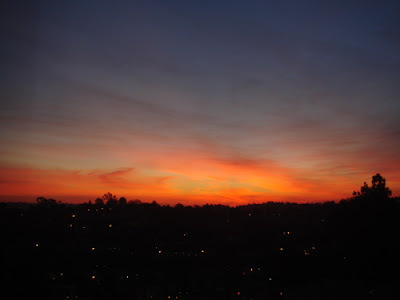 Would you believe that this picture really does no justice to the breathtaking beauty of the sunrise that morning? Also, take a look at the new look and feel of Tranquil Mammoth. What do you think? I decided that I needed to change it up for 2009. I always strive to be at the forefront of style and sophistication, so why should my blog be an exception? Ok...this short blog has come to an end. I've noticed that because I update so much on Twitter, I haven't been including much about what I've been up to in my blog entries. Subconsciously I'm trying to avoid being redundant, but I guess there's no shame in redundancy. I mean, after all, it's the internet; it's already redundant! FACT 1: I have been appointed as Vegan Ambassador for Macbeth Footwear. Read about it here, and here. Also, check out some pictures that Ryan Russell took of me here. FACT 2: I had a "white" x-mas, meaning that huge snow flakes were falling from the sky when I woke up on December 25, 2008. I was in Grass Valley, and in Grass Valley that kind of weather is not unheard of, or undreamt of. FACT 3: AFI played KROQ's "Almost Acoustic Christmas" on December 13, 2008. On our final song, "Love Like Winter," I mashed my knee up. I have since recovered. FACT 4: I saw The Cure play at the Troubador on December 13, and at the Gibson Arena on December 14, both 2008. I love The Cure. I finally met Robert. FACT 5: Hunter Revenge played at Cinespace on December 21, 2008. Since my usual keyboardist, Dan Kelly, was unable to play (due some sort of family reunion), I had, for the first time ever, two keyboardists on stage to replace him. Missed it? Come see Hunter Revenge play Cinespace AGAIN on February 1, 2009. I'll provide more information about this in the future. FACT 6: I grew a "holiday beard" and eventually shaved that damn thing off. Beards are for Rip Van Winkles. FACT 7: I did not get engaged. Google it. FACT 8: I have a new shoe coming out in February, 2009. It's called "The Hunter" and is 100% vegan. It's also 10,000,000% awesome. Take a look at it here before you order 6 pairs. Yes, the shoes are bulletproof. No, I haven't actually tested them against bullets. Would you like to? 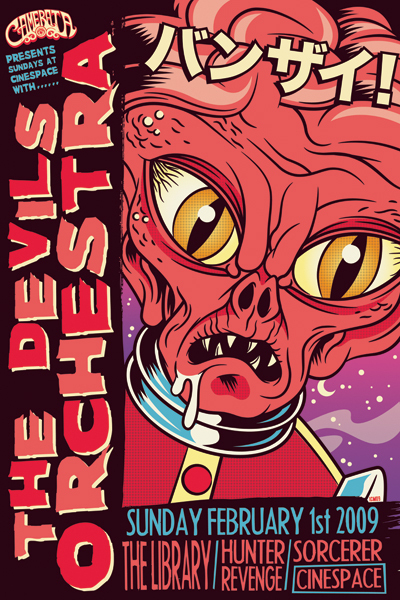 "For this next trick I'll need a volunteer from the audience..."
FACT 9: While in the studio, working on AFI's eighth studio album, I recorded twelve tracks of bass on a single song. That being said, I feel I must clarify that at most, there are no more than three distinct performances at any given moment in the song. Also, technically three of the tracks are baritone guitar, doubling my bass line. I still think this qualifies me for some type of award. Excessive Bassist of the Year? FACT 10: Speaking of awards, I was successfully nominated for two Shorty Awards. One of the categories (#awesome) isn't an official category, but still quite awesome. Go vote for me in the other category, #music: http://shortyawards.com/user/TranquilMammoth I need your votes to win! Voting ends January 23, 2009. 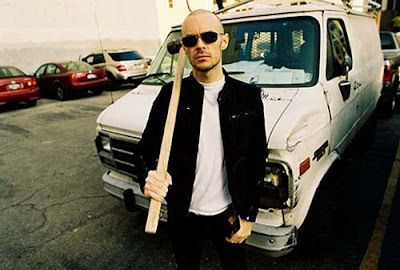 FACT 11: Joe Principe (of Rise Against fame) and I are having a conversation right now about how to make bass the "it" instrument for 2009. Kids all over the world should (and will) want to play bass above all other instruments. Ever hear of Bass Hero™? Well maybe somebody will invent that once they catch on to what's happening. If you're asking yourself, "Where's the 12th fact, Hunter?" then I'm asking you this: Why are you calling yourself Hunter? Is it your name too? (I'll admit that Hunter is a pretty strange name to call yourself, even if it IS your name.) The answer is this: In 2009, numbers don't matter as much as they did in 2008. Think way back to the baker's dozen. I'm not sure what year that was invented, but I can tell you that twelve equalled thirteen that year! Be happy with eleven. Now quit reading this and go give blood! Now that all my bass parts have been recorded for the upcoming AFI record, and I have finally finished watching all of the Begin Transmission video submissions, I had a chance to finish up my list of resolutions for the new year. 1. Blog More Often - I have a tendency to write long blogs, and that takes time. 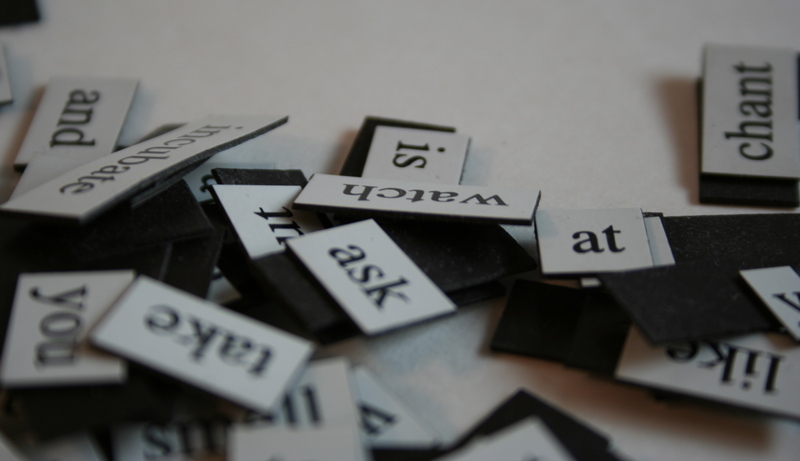 In 2009, I resolve to also write shorter, more frequent blogs as well. Sometimes a good picture is enough. Pictures = 1000 words, right? 2. Join A Celebrity Gym - Since my body is somewhere between Beaker and Bubbles De Vere (both celebrities), I naturally feel like I should join a celebrity gym where I can run on the treadmill next to people like Phil Collins and Bea Arthur. In a celebrity gym, this would be possible. I would to be able to ask Michael "Biv" Bivins or Conan O'Brien if they will spot me. "Hey Neil Patrick Harris, are you done with those 75 lb. dumbells?" I would look over when I'm on the eliptical and see David Bowie working up a sweat. George Michael, would have a fresh towel for me to borrow, and Jeff Garlin (well he should be there) would let me borrow some coins for the vending machine. On another day, I'd see the Olsen twins and Steve Martin working on their abs with one of those inflatable balls. I'd see Snoop Doggy Dogg and Stevie Wonder on the (tandem) exercycle, and the dad from Silver Spoons working those glutes. I'd also see Bruce Lee somehow. Yes, in 2009, I resolve to join a celebrity gym if only for the chance to see these people, and the many other celebrities that I haven't mentioned in my blog over the years. 4. Quit Smocking - Before you jump at the chance to correct my typo (it's not a typo) or yell at me for smoking (I don't smoke) I'd like to send you HERE. Can you believe how many people misspell smoking? Typos bother me, but misspelled words drive me up the wall! This isn't really a resolution- or is it? In 2009, I resolve to triple spell check EVERYTHING I write, including text messages. You should too. 5. Clean Out The Spare Closet - I have a spare closet that is filled with things I couldn't possibly use. Things like The Force's Complete Discography on 12" vinyl. In 2009, I resolve to get rid of these things at any cost, even if it means selling them on ebay. Wait! That's it! In 2009, I resolve to sell a bunch of stuff on ebay! Stayed tuned for details!! 6. Go Even Greener - In 2006 we saw An Inconvenient Truth and it freaked us out. We panicked, and started recycling and carpooling, but eventually we forgot about greenhouse gasses. In 2007, the Live Earth Concerts reminded us that our carbon footprint needed to be smaller (or nonexistent) and we freaked out again. We brought our own bags to the grocery store, traded our SUVs for Priuses and even thought about solar panels, but eventually we forgot about saving the planet. In 2008, gas prices soared so high that we ditched our cars and took the bus, or the train, or a bike, or even our feet. Companies started responding to the consumers' need for "green" versions of existing products. We made more steps in the right direction, but we keep running into the same problem: when we don't notice immediate changes, we give up and our efforts fade into history. In 2009, I resolve to continue to modify my lifestyle to better preserve the planet for future generations. Going green isn't something you do once. It's not a light bulb you buy, it's a change you make in your lifestyle and in the way you think. So that's my list. 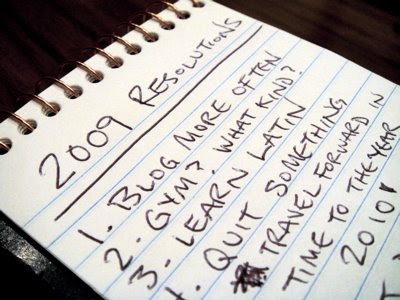 What are your resolutions for the year 2009? 7. Learn The Guitar Solo From Skid Row's "I Remember You" - I forgot to add this very important one. It was early and I hadn't had any coffee yet. Dave "The Snake" Sabo Scotti Hill. Pinch harmonics. Bends. Palm mutes. Hammer-ons. Pull-offs. Dives. This one has it all! In 2008, I resolved to learn the solo from Aerosmith's "Angel" and in 2009, it will be Skid Row's "I Remember You." While trying to make a list of New Year's Resolutions, I decided to waste time with a completely unrelated list. Before I begin, I'd like to stress that as a vegan and animal lover, there are almost no circumstances under which I would ever harm a living creature. The following situations and techniques are for the exception to that rule. These are to be assumed as "life or death" situations. 1. 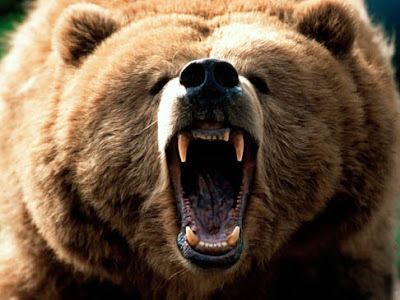 Grizzly Bear - Since most bears can outrun any human (even Carl Lewis) and they typically disembowel their victims, the key to fighting a grizzly bear is to distract it, then incapacitate it. To distract it, I would employ the use of a laser. No laser pointer or laser sight is enough to do the trick, however. I'm talking about a laser light show. Pink Floyd style. I seem to recall seeing a travel size version of this at Guitar Center. Don't correct me if I'm wrong. Once the bear is distracted, I would knock it on the head with a bowling ball. A 14 lb. ball (or heavier) will do the trick. Don't go into battle with one of those hot pink 8 lb. balls they have at the bowling alley unless you want your guts spread all around the forest. One or two hits to the head should be enough to render the bear unconscious. Remember, I'm not trying to kill the poor creature, just protect myself from imminent death. 2. Shark - Once a shark gets a taste of your blood, it will eat you. That's just a fact. Make a note to never serve hors d'oeuvres made from your own blood at a party that sharks will be attending. Since the vast majority of shark fights take place underwater, let's assume that for my shark fight, I'm also underwater. Let's also assume that I'm wearing military grade scuba gear. The gear would of course be state of the art and I would look really good wearing it (I'm hoping I will get some sort of scuba gear sponsorship out of this.) Now on to the fight. 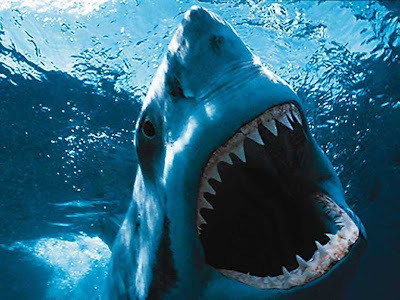 Sharks are just mouths that can swim, but those mouths are filled with thousands of razor sharp teeth. I imagine that (once again, don't correct me if I'm wrong) with enough peanut butter, you could make the shark's mouth stick together. It would take more than just a jar of Skippy and a spoon though. I would need something that sprays a high volume of peanut butter at a high velocity underwater. We'll call this device the Peanut Blaster™. (If any food-weaponry companies out there want to manufacture the Peanut Blaster™, get in touch with my lawyer and we'll work something out. I have detailed schematics in my head.) A shark fight is that simple. I'll blast the shark in the mouth with the Peanut Blaster™ set to "stun" and then swim away in my new scuba gear. 3. Tyrannosaurus Rex - Fighting a T. Rex requires encountering one, and that requires owning a time machine, which I do. However, I think this unique set of circumstances raises the question, "Why fight a T. Rex when you could just travel to a time of obvious safety instead?" Normally I would do just that, travel forward or backward through time to avoid a T. Rex fight. But what if the time machine was damaged by a clumsy Diplodocus? I would have no other choice than to fight a T. Rex if cornered. 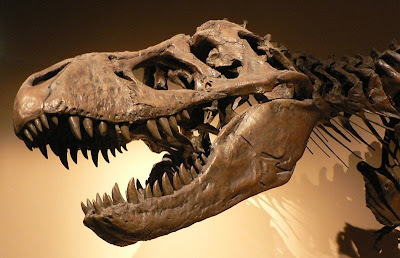 Since T. Rexes' teeth can crush bone, and they have binocular vision, comparable or better than modern hawks, I would have to avoid being seen in order to avoid being eaten. I would quickly dress in camouflage to avoid being seen. I prefer pink and grey camouflage if available, since it's a fact that all dinosaurs are color blind (okay, it's not a fact, it's my theory.) Then I would sneak up behind the T. Rex and, with a jack hammer, break one of his tibias before he is able to turn around. T. Rexes are notoriously slow at turning around. Hopefully this would buy enough time to fix my time machine. If not, I would resort to blinding him with the Peanut Blaster™. 4. 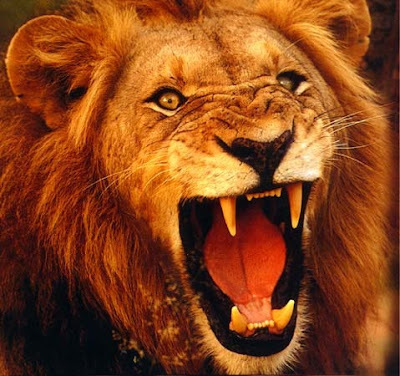 Lion - Lions are the rightful kings of the jungle, and I would never attempt to fight a king in his own kingdom. So let's just say, for the sake of this blog, that the lion is in my kitchen. Normally I would use a similar technique for lions, tigers and bears- the laser/bowling ball combo. Since you've already heard me explain that one, I'll illustrate another technique. I call this one Plan B. Plan B consists of two things: 1. The element of surprise, and 2. Piping hot soup. I always keep a a large (but light-weight) cauldron of piping hot soup in my kitchen, usually split pea, or some type of vegan bisque. In order to surprise the lion, I will need to do something it would never expect. First I would turn my stereo on full blast. Lenny Kravitz's "Are You Gonna Go My Way?" is the song of choice when fighting lions. The intensity of Lenny's guitar riff during the intro might be enough to surprise the lion, but I wouldn't stop there. Next I would turn off all the lights except for the strobe light above the stove. While the lion is recovering from this confusing change of scene, I would knock over the cauldron of soup, effectively covering the floor, making it hot and slippery. Finally, I would swing down from atop the fridge on a rope made of hemp and kick the lion back into a pit. If you're going to try this technique at home (which I highly recommend) you may want to dig a pit in your kitchen like I have. Taking care of this in advance will ensure that you are ready for almost any wild mammal attacks in your home. I have covered my pit with a few leafy branches and most days I don't even notice it. 5. Cobra - Can you outrun a cobra? My guess is no. Even if you're fast, eventually you may have to fight a cobra. Here's what I would do if I had to fight one. First I would check to see if it's a spitting cobra. Spitting (like yawning) is contagious. Pay close attention to the dugout at a professional baseball game for an example of this phenomenon. If I spit over to my right and the cobra does nothing, I know it's safe to approach with a hockey stick covered in molasses. Cobras love molasses (as always, don't correct me if I'm wrong) and will be trying to lick the hockey stick the whole time I'm pummeling the poor creature. Case closed. 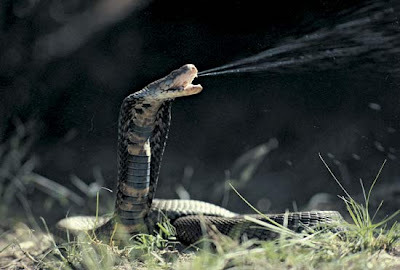 However, if I spit over to the right and the cobra spits over to its right, I know I've got a spitting cobra on my hands and all bets are off. The Peanut Blaster™ is useless against snakes, as are most soups and strobes. Lasers are mildly effective, but require precise positioning, which is often hard to do with little or no time in such a stressful situation. Your best bet, and what I would do, is quickly build a fire. Snakes hate fire (as demonstrated in Indiana Jones films) and will either retreat to look for supplies to make smores, or become aggressively hostile. If the latter is the case, I would let the cobra chase me into a hall of mirrors. Cobras may be deadly, but they're not that smart. I'm sure I could trick the cobra into attacking my reflection enough times that it would eventually grow weary and give up. Hopefully we will all be lucky enough to never have to fight these animals. Normally this is where you would find a legal disclaimer, warning you to never fight animals and to never use my techniques. You'll find no disclaimer here, just this warning: If you happen to find yourself face to face with one of these formidable creatures and DO NOT use my techniques, you're as good as dead, and I will not visit your grave!